This has become my favorite potato dish. Since, I love potatoes in almost all manner of presentation, the statement says a lot. I have made them more than once, at this point, and I season them differently each time. Last time, onion powder and rosemary proved itself in this dish. Although this is coated in oil, the potato, itself did not feel or taste greasy. The crispness of skin is what made it heavenly. I am thinking of using this method for stuffed potatoes, cooking them first and then stuffing them and baking for a little while longer until the cheese melts and veggies are heated through. In a large pot, cover baby potatoes with water and bring to a boil. Simmer just until slightly firm. Drain and cool immediately, and set aside. 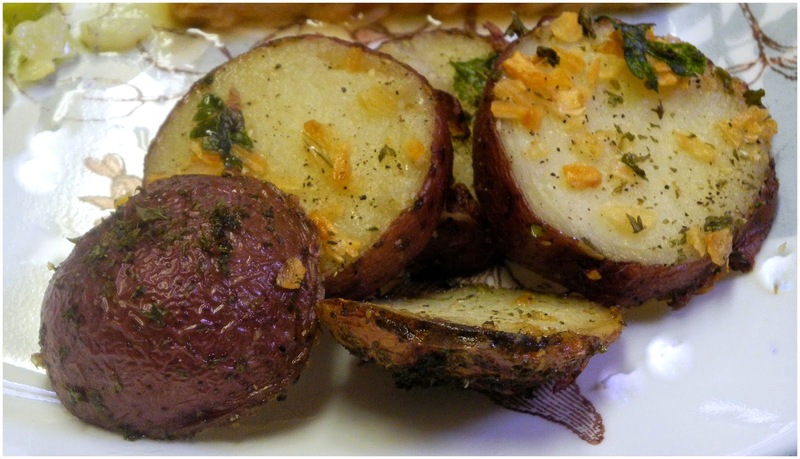 Slice cooled potatoes in half and gently toss with olive oil, salt and pepper, being sure to coat well. Place potatoes, cut-side down, on a non-stick baking pan (I used parchment paper on a cookie sheet.) and roast in the oven for 15-20 minutes, or until golden brown and crispy. I love any kind of roasted vegetable, and I like your tip to cook the potatoes first. There is nothing like a crispy and well seasoned potato! However, in our house because my husband is Sephardic- he is a rice eater, so we tend to have rice in almost every way possible. We love potatoes, cooked in any way! And this looks delicious. I know that my family would enjoy it very much! We eat a great deal of potatoes here. SO GOOD! I love potatoes! These sound yummy, but I'm loving the idea of baking them stuffed. Thanks for sharing on Weekend Bites - you've been featured! Sounds great! I'm also a huge potato fan. Almost any way, I love them. Thanks for sharing with the Happy Holiday Link Party! I like how easily you could change the flavors. Great side dish!